(TORONTO, ON. – September 30, 2014) The popular, Canadian-built compact SUV – the 2015 Toyota RAV4 – is impressive by any measure. The RAV4 combines driving dynamics, comfort for driver and passengers, cargo-hauling versatility, fuel efficiency and bold styling to make it a perfect choice for busy Canadian lifestyles. The 2015 RAV4 is offered in five models – two with very efficient front-wheel-drive and three with the added confidence of Toyota’s Dynamic Torque Control AWD System. Whichever model you choose, each is engineered for fun, comfort, style, versatility and performance. All 2015 RAV4 models feature a 176 HP 2.5L 4-cylinder engine coupled to a six-speed automatic transmission with sequential shift mode and three driver selectable drive modes – Sport, ECO and Normal – to match RAV4’s performance and efficiency to one’s driving style or road conditions. The boldly sculpted body is visually distinct, and the styling contributes to RAV4’s significant cargo capacity. It also confers an abundance of legroom for those sitting in the reclining rear seats. A lift-back rear door and lower loading height make it easier to load and unload up to 1,090 liters worth of groceries, golf bags, garden gear, or other goodies. The 2015 RAV4 also receives top marks for safety, as every model is equipped with eight airbags, anchor points for child protector seats, available auto highbeams, lane departure alert and blind spot monitor. As with every new Toyota since 2011, the 2015 RAV4 is also standard equipped with the six active safety technologies of the Star Safety System: Antilock Brake System, Brake Assist, Electronic Brake-force Distribution, Vehicle Stability Control, Active Traction Control and Smart Stop Technology work together to help drivers avoid potential accident situations. All 2015 RAV4 models come with comfort and convenience features, including: Audio systems equipped with USB inputs and Bluetooth connectivity for portable devices, plus steering wheel-mounted audio and Bluetooth controls; air conditioning; power door locks with keyless entry; a full range of instrumentation including an eco drive monitor, outside temperature gauge and more; power windows with driver’s side auto down; a tilting/telescoping steering column; cargo and map lamps; plenty of thoughtful in-cabin storage; cruise control; 12-volt accessory power outlet and retained accessory power; reclining rear seats with a 60/40 split fold-down configuration, plus fold-down centre armrest; dual power adjustable and heated exterior mirrors with integrated signal lamps; a rear spoiler with integrated LED stop lamp; and more. These models feature a four-speaker audio system with AM/FM/CD with mp3/WMA capability; fabric seat surfaces; 17” steel wheels; and more. These models feature: a 6.1” Display Audio system with six speakers, steering wheel-mounted voice recognition controls, and integrated XM Satellite Radio; dual zone automatic climate control; heated front sport seats; premium fabric seat surfaces; a back-up camera; auto up/down function on driver window; rear privacy glass; tonneau cover; scuff plates; a soft-touch instrument panel with stitching; chrome inner door handles; automatic headlamps; 17” aluminum alloy wheels with locks; roof rails; a power moon roof; variable intermittent wipers; fog lamps; and more. These models may be ordered with the available Navigation Package, which adds: Navigation. This model features: Toyota’s 6.1” Display Audio system with six speakers, steering wheel-mounted voice recognition controls, and integrated XM Satellite Radio; Navigation; dual zone automatic climate control; eight-way power adjustable driver’s seat with lumbar support, cushion height, and memory system; heated front seats; SofTex seat surfaces; a back-up camera; auto up/down function on driver’s side window; auto-dimming rear view mirror; rear privacy glass; tonneau cover; cargo net; leather-wrapped steering wheel and shift knob; simulated leather door trim; chrome inner door handles; a sliding front centre console box; illuminated front cup holder; a power lift gate with remote operation; smart key system; push button start; scuff plates; a soft-touch instrument panel with stitching; 18” aluminum alloy wheels with locks; roof rails; a power moon roof; variable intermittent wipers; fog lamps; and more. The 2015 Toyota RAV4 is now on sale at Toyota Dealers across Canada. 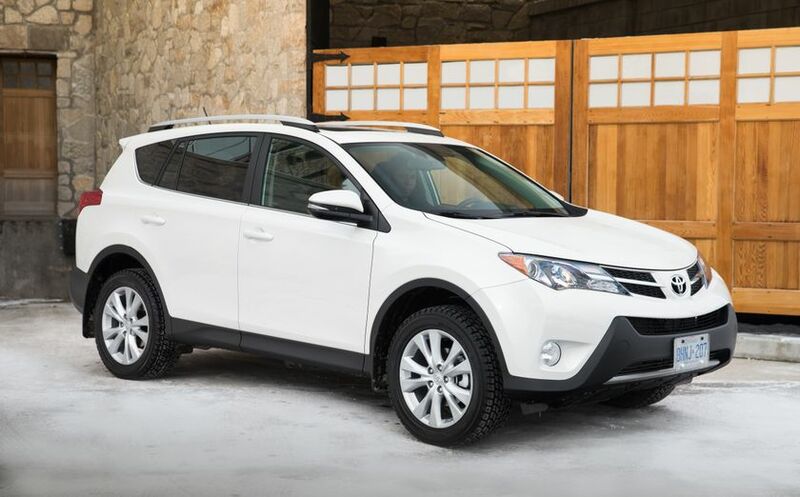 For more information on features and specifications, visit www.toyota.ca/rav4.